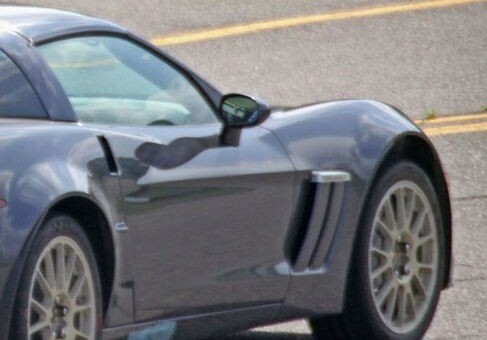 While there’s not much to see here, this should shut up all of the rumors that the next generation ‘Vette will feature a mid-engine configuration, as whatever bells and whistles underneath that shell of a Corvette Grand Sport are definitely not featured anywhere else but the front. As for what kind of engine is featured under the hood of the mule remains a huge mystery. Will we see a twin-turbocharged V6? Maybe a high-revving V8? Who knows, but we might see both eventually, going off what we see with the current ladder of models offered. For more photos, head to Straightline. Manoli you will find both engines a TTv-6 and a lower displacement v-8 in the 3 liter range the tooling is already going into power train to make both of these, they are necessary due to the overseas taxation of displacement. both engines will be world class and you may in the near future see a dual drive system both gas and electric which gives both performance and fuel economy this may drive all wheels. the future is bright if the feds can get the economy in order. i don’t know why the magazines keep spreading the rumor of a TTV6 Vette. just like how since the early 70s the rumor of a mid-engined Vette is always around the corner. Yet one never materializes, and thankfully so. the day they make a Twin turbo V6 Vette will be the day the Vette ceases being a Vette. just like when the Vette goes mid engined. just like the rear engined 911 and the mid engined template for Lamborghini, front (well front mid-ship for the current gen) mounted V8s is Corvette DNA through and through. leave it ALONE. AWD as an option? maybe. but remember, that adds complexity AND cost. never mind it hurts handeling. to date there are no AWD sports cars that can out do RWD cars at the limit. their only advantage is when being driven by no talent drives and in dead stop launches, or the occasional drive through inclement weather. My company makes the tooling to mold parts of the doors for all GM cars. We have been told the new corvette doors are still being designed and to expect to get final designs this summer. This means the new Corvette will not be available until at least summer of 2013. Probably fall of 2013.